View basket “Tabla Case” has been added to your basket. All these Tablas are made by own manufacturers, supervised and inspected all the way by myself, under my vigilant observation and strict instructions and directions all the way from start to finish until you have it in your own hands. At any given day or at any time, I am prepared to close my eyes and just pick any of my Tablas off the shelf and take it to any gig, concert, workshop or recording session… All the Tablas are made equally and you will always have a drum that I am proud to call “MY OWN”. Head: Made in Cairo, Standard Synthetic. The Tablas weigh 5.5 Kgs each which is about 13 lb. And an average of 4 extra kilos or so for the packaging. Hello Ramzy! Tha instrument is perfect. It’s very beautiful to look at and it has a very clear high tone. Thank you very much! Beautiful, beautiful instrument. Sharp and clear with full dums, weighs a ton and stays just where I want it even when I’m knocking the daylights out of it. But best of all is that its just beautiful to look at. The pawa is irridescent and the finish is excellent. I LOVE it!!! I have owned and played a lot of tablas from the top makers around the world, the Hossam Ramzy Signature Series Tabla is by far the best. The casting is as close to perfect as it can get. The inlay job is superior with a thick clear coat ensuring a very strong finish. 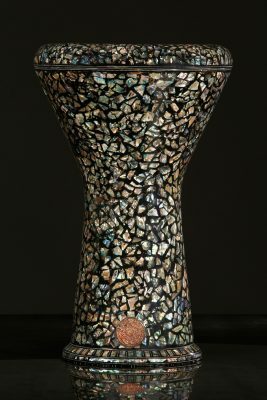 The sound quality is superb, with the heavy casting and think inlay it really does sound very close to a clay and fish skin tabla. Every tek sings in a perfect C pitch all the way around the rim. The dum is also in C and has a very deep clear punch that carries through to the next note. This is a very important aspect because in the studio the ability to match the timber of the melody instruments is key to the sonic alignment of the notes. Just looking at the drum makes me pick it up. The striking appearance draws all eyes right to it. Thanks Mr. Ramzy for such a beautiful instrument! Hi. I own a Signature for four months, and I think is an amazing instrument. I´ve played it in several bellydance shows as well as at home. In both cases, the response is fantastic. I own several darbukas of some well-known constructors and that one is by far my favourite since I obtain exactly the sounds I want. The finish is beautiful and smooth, It´s nice to own a 100% mother of pearl-made tabla, and the weight is exactly what I needed: enough to get the drum stable while playing it. Totally recommended if you´re serious about playing the tabla. To begin with, I would like to acknowledge what a professional and respectful individual Mr. Ramzy is. As for his drum, it is fantastic in all ways. The cast is very heavy(the heaviest of it’s size). The balancing of the rear of the drum is a wonderful touch. The bearing edge of the rim, and smaller qualities such as the inlay and inside finish are precise and flawless. And of course, the sound is great. The teks sound identical all the way around and the slaps are the sharpest I’ve heard a drum produce. A truly fantastic and professional quality drum. I highly recommend it. Thank you, Hossam. When my tabla arrived, I was a bit concerned because the shipping box had many dents and a hole large enough to put my hand in. But thanks to your abundant use of bubble wrap, the tabla was in excellent condition! It is everything you said it would be. The workmanship and tone are exceptional. I have been playing it for over a month now and my only problem is that I find myself playing with my eyes closed. Not only to lose myself in its beautiful sound but because when I look at it, I stop playing and start caressing it, which makes my wife jealous! Needless to say, it was worth every penny and is now the pride of my collection! Thank You Again Hossam. Am very happy with my new Signature drum. The sound is lovely and controlled, the taks loud, bright and with a shorter decay than my GEF, which I like. Dum is full and punchy. Still need to tinker with tuning a little to even out the rim and tek but pitch is pretty darn close to consistent round the head. 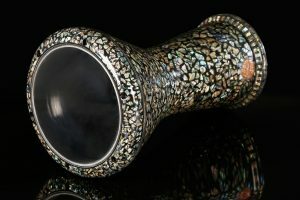 Quality of the drum overall is superb, inlay work, casting and finish, and it is a lovely weight which sits in the lap nicely. This tabla definitely has pride of place amongst my other drums. Cheers Mr Ramzy, I look forward to playing it for some dancers. I sent several emails before my purchase and all were answered promptly. I was surprised to see my tabla came in only a few days. It was wrapped very very well. So I opened it up. WOW WOW WOW, I am blown away by this tabla. When I first laid eyes on it I almost died it was so amazing looking. The pictures DO NOT do this drum justice. Be sure you are sitting down when you see yours for the first time. I have literally been in SHOCK for the last few days basking in the glory of my new drum. It is one of the most beautiful objects I have EVER SEEN. Ok, I didn’t buy this drum cause it looks pretty! I’m a drummer, and sound quality, feel, and construction quality are the main priority. First the bearing edge is perfectly smooth and perfectly machined. The relationship between the bearing edge and rim is perfect and level, with no gaps or out of roundness. The inside and outside have a very thick coat of sealer making the drum very tough. 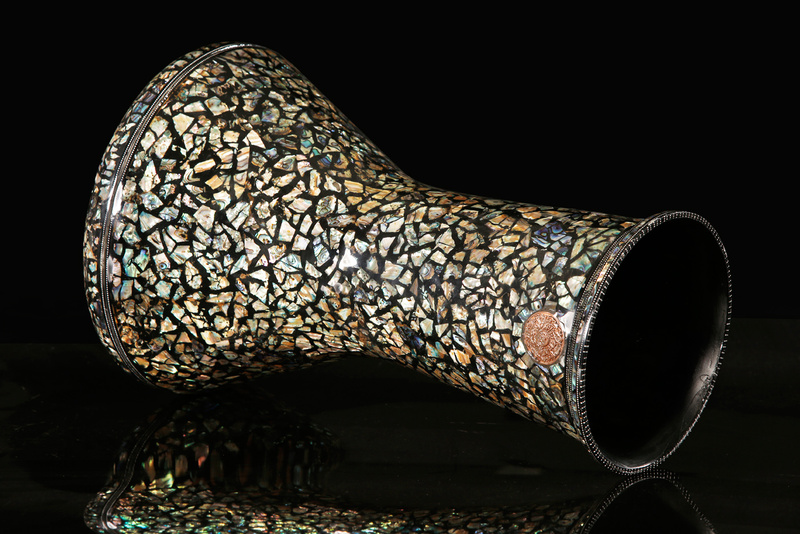 The inlay work is done to perfection over every inch of the drum, no shortcuts. Compared to my 2010 GEF, the Doum is punchier, and the Teks have a papery thin quality I have always longed for. The slaps and pops are the best I’ve ever heard and feel effortless. My drum weighed in on a postal scale at 12lbs 12oz and stays put! Now I know what a real tabla feels like. Thank you Mr. Ramzy and staff for offering a tabla that fills a drummers heart in every aspect. Hossam, I’ve had your wonderful drum for several months now and it seems to get better every time I play it! It has such a wonderful separation of the “tek” and the “doum,” much more so than any other tabla I’ve owned. It is also nice and LOUD when you need to cut through amplified instruments, but it doesn’t lose anything when you play it quietly. The finish is incredible and just glistens in the light. This is such a fine instrument. It is the “final” tabla that we drummers always search for. My other tablas are very good, but they don’t hold a candle this baby! My new Signature drum is just fabulous! The tonal range is vast. It’s such a ‘musical’ drum. I once owned a very sporty Alfa Romeo. Even driving to the shops in that car was an experience to be cherished. I like to think I’ve matured a little since then, but playing this drum gives me the same sense of fun and enjoyment. Every time I pick it up to play… IT takes ME on a journey! I just love it. I look forward to many such journeys together with this drum. This instrument is absolutly remarkable! My eyes are just welling up with such joy when I say this. I’m not sure what it is about this drum, but it has more than met my every one expectations. It has blown the top. All the claims and reviews on the web are true. The pictures I’ve seen do not display this absolute beauty. 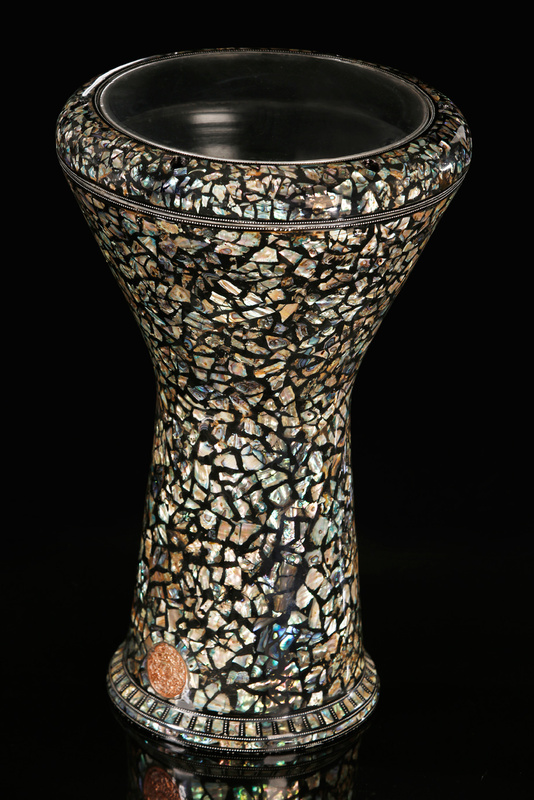 This drum sparkles like nothing I’ve seen. And the colors, MY GOD!! The colors are so rich on it. The casting is quite solid, and heavy, not like my other drum which has some type of filler or bondo on the inside. One simply must take the plunge and buy one. Just Like I did. Or save up just for this one drum. It will be money very well spent. When it arrived, I was never able to put it down. I failed to show up for work because of it. I played all day long and fell asleep with it in my arms. So much love and care went into making this drum and it will be loved and care for for the rest of it’s life. 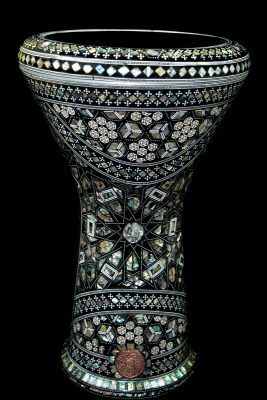 Wonderful looking drum, in size just a little bigger than regular size darbuka. I think it’s named “sumbaty”. Super unique and constant sound of Tek on every place at the rim. Good and very loud Dum sound. Best purchase that I ever had. Superb drum! This drum is beautiful, heavy, and sounds great. I love the irridescent MOP inlay, and the black paint. I would love to try to see if a REMO SkynDeep head would fit instead of the plastic mylar. I’ve also though of having a friend make a custom fish skin head for it. Besides the mylar heads, this drum is top notch and a joy to play. my Name is Achim Grünewald, I am from Germany. My English is not very good but I try to ask you some questions. I did play your Hossam Ramzy Signature Darabuka.My Friend have one. It s sound very good. My Questian is: Kann I buy It hear – can you send it to Germany ? Kann I buy it in Euro ? I think the Price in Euro is 211,68? My new baby has arrived safe and well Hossam, thankyou for such a beautiful instrument. It sounds wonderful and I can’t wait to show it off !!!!!! I notice that the size of the drum is larger than the average Tabla, maybe more like a "Sombati" (not sure if I used the right term here), but smaller than a Dohola. Were you looking to create a different sound or something with the design? At 4 pm today I received the Tabla! The way it was packaged was enough to keep it in one piece even if it was dropped from a plane! As for the tabla itself, well, what can I say: A Master piece created by who other than a Master. The photos on the website do not show its real beauty. I have never seen anything like it. As for the sound, well well, its another story. An incredibe sound. Nothing is needed in terms of tuning. Thank you Hossam for your invaluable help and advice. I received my tabla on March 12, 2013. It is spectacular, to say the least. It is not only a physical work of art…the sound is nothing short of extraordinary. The cleanest and clearest of tones. I am in love. Thank you, Master Hossam, for making such a thing of beauty available. All I can say is WOW! This is the tabla I have dreamed of for too long and wasting money trying to find it with all the other tablas of this type. The sound is outrageous if you play loud or soft, the clear quality of tone is amazing. This drum practically plays itself and is very comfortable to play. Fits perfectly in my lap and stays there. Teks and doum, slaps, everything is super clear. I am in love with this drum!!! The picture on the website does not even come close however. Gorgeous.. Hossam was also very professional and friendly and I got my drum very quickly safe and sound. One of the best purchases ever. Can’t wait to play into the wee hours. Thank you Hossam!!!! I was fortunate enough to visit my drum teacher and mentor Hossam Ramzy in his studio near London, England. Here I had the chance to play one of Hossam’s Signature tabla’s. I also was lucky enough to see video of the tabla making process in his factory. I played on the tabla for ten days while I was there. I quickly came to the conclusion to get one of these. It sounded so much better than the other tablas I had purchased from Egypt. The tabla has rich dum’s and crisp tek’s. 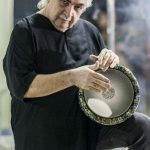 So, I purchased my own… And when I received Hossam’s Signature tabla from his factory in Cairo, Egypt, it was so beautifully crafted! It looked like a million dollars. You could see a lot of quality workmanship went into design and construction. I did my first performance with my new Signature Tabla and after I played in front of an audience, this was the first time I used this tabla in public, people came to me after the performance and commented on how crisp and clean the performance was. They noticed a change. They talked about how much my tones had improved. The tabla also projected sound excellently. My first live performance with the tabla was a winning result! I used it on a large stage with no microphone. There was an audience of about 200 people. I thought that size of audience would for sure absorb all of the sound…. But the tabla cut right through and boomed throughout the theatre. 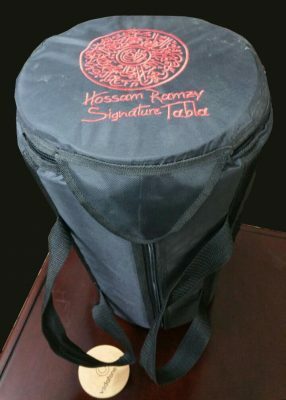 Buying the Hossam Ramzy Signature Tabla was a perfect choice and the best choice really. It has made me stand out and sound great! I\’m learning to play the tabla with a Hossam Ramzy Signature and is totally different to the other tablas it is gorgeous wherever you look and its sound it\’s so perfect, I\’m really inlove with her!!! !, I don\’t want anyone to lend me another tabla, when I forget her for class I prefer back to my home and take her with me. It is definitely a great investment. The best investment i have made as a drummer yet. My new sombati arrived very well packed in a big parcel sporting Hossam’s logo on the front. It arrived so early in the day i was surprised and eagerly opened it up to find the sombati in perfect, pristine condition. What a beauty too. The inlay is truly remarkable to behold and i had family members trying to convince me to let them have it as an ornament! Unfortunately i had to do a lot of work to do that day so i only got to start playing it hours later… but when i did get the chance, i couldn’t stop playing it! Wow! It sounds so much better than my standard size mother of pearl darbuka. The sombati is so crisp and clean in sound, i am so happy with it i am hooked! Hossam was truly a pleasure to talk to via email when i was in the process of ordering. I also purchased one of Hossam’s signature sombati heads too (the Renaissance version), which he very kindly offered to put on the drum for me. I received the clear mylar head as a free spare too! Hossam really cares for each and every one of these drums, and it is evident in the final product. Other drums and other instruments all have professional players with their own signature products available to buy… but those i’ve encountered have never had direct contact with each instrument after the initial prototype. This vital difference makes Hossam’s Signature Tablas stand out from all the rest. When i learnt about these drums and saw their process i knew i had to get one. We live in an age where these drums are so easily available, but as far as i know, no one provides the service Hossam does. These are drums that he is involved with personally, and are all drums he would play himself. I knew when i bought it that i would be getting something of high quality, and i was correct. The sound is so clear and it makes me feel like i’ve accomplished more when i practice. My sombati is truly a joy to play. 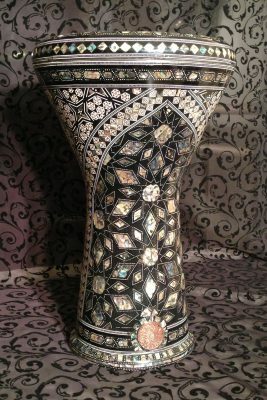 I have been looking for years for the darbuka with the right sound, the right sound that have resonated in my head since I heard the darbuka for the first time about 60 years ago. Sound that is tight and sing at any dynamics. I must admit, I took a gamble when I decided to purchase the signature darbuka from Hossam Ramzy a decision which was based on a yootube clip. The darbuka arrived to my house, it exceeded all expectation, the sound is amazing, the dynamics is out of this world, it is truly a master piece. 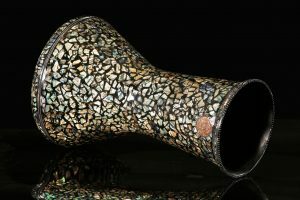 The attention to details in making this musical instrument gives me the inspiration to play it non-stop. Mr. Ramzy created a piece of art. Thank you Hossam. 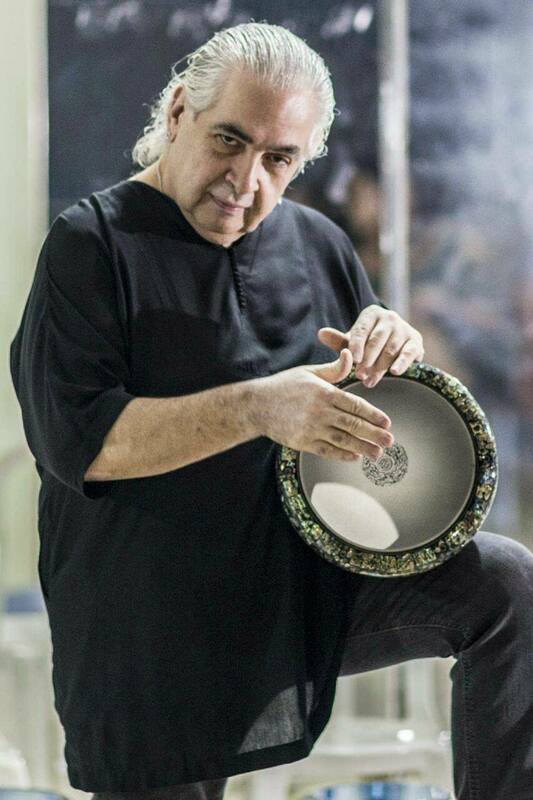 Hossam Ramzy Signature Tabla (R) Replacement Head.